During her first year at Texas Tech, Lillian Glezen made a bet with one of her sisters that, if she earned a “B” in math, she would get to ride in a small plane. From that first airplane ride, she knew that she wanted to learn to fly. Lillian Glezen Wray, affectionately known as “Jay” as well as “Nanny Duke” and “Grandma Turtle,” was born in Gilmer, Texas on Dec. 9, 1913 to Thomas Hamilton and Lillian Corn Glezen. The young couple had recently moved their growing family from Indiana to Texas. Lillian was not only the youngest of eleven children, she was the only “native Texan” and a true tomboy. Lillian attended Gilmer public schools, where she became an excellent tennis player. Following her high school graduation, she attended East Texas State Teachers College in Commerce, Texas (now Texas A&M Commerce) and Texas Tech University in Lubbock, Texas. When America was attacked at Pearl Harbor on Dec. 7, 1941, Lillian was working as a switchboard operator at the Southwest Phone Company in Waco, Texas. After Pearl Harbor, she soon moved to Fort Worth and took a job at Consolidated Aircraft, working as an inspector on the B-24 assembly line. She used part of her pay to take flying lessons. 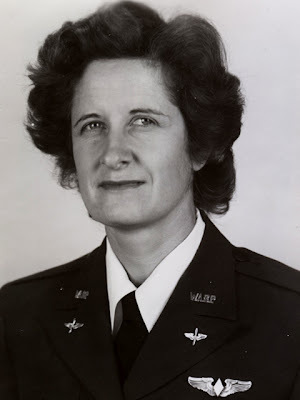 When she had acquired the number of newly reduced minimum required flying hours (35), she applied for WASP training and was accepted into class 44-W-9. In April of 1944, Lillian and 106 other young women pilots arrived in Sweetwater, Texas and reported to Avenger Field for WASP training. After seven months of AAF flying training, in November, 1944, Lillian and fifty-four of her classmates graduated, received their silver WASP wings, and became Women Airforce Service Pilots (WASP, the first women in history to fly America’s military aircraft). She was then stationed at Goodfellow Army Air Base in San Angelo, Texas, where she flew AT-6s and BT-13s, training male cadets. She also occasionally ferried PT-19s to other air bases. On 20 December 1944, the WASP were disbanded and Lillian returned to Fort Worth. She soon accepted a job with the CAA (now the FAA) in Alburquerque, New Mexico. After several years and transfers, she accepted a job in Region II in Salt Lake City, Utah as an air traffic controller. It was there, in 1947, that she met her future husband, Johnston Wray, who was also an air traffic controller. Lillian and Johnston married, started their family, and eventually settled in Burbank, California. The couple successfully raised three sons: John, Gordon, and Dan, and were also the proud grandparent of six grandchildren: Jaisha, Karleen, Cody, Morgan, Danny Jr. and Gordon. Over the years, Lillian stayed close to her WASP friends attending countless WASP reunions all over the country. She enjoyed a life-long sense of adventure and was always proud of the progress the WASP made for women’s equality. She also kept up with her home town news. She subscribed to The Gilmer Mirror, the local newspaper, which she read twice a week. 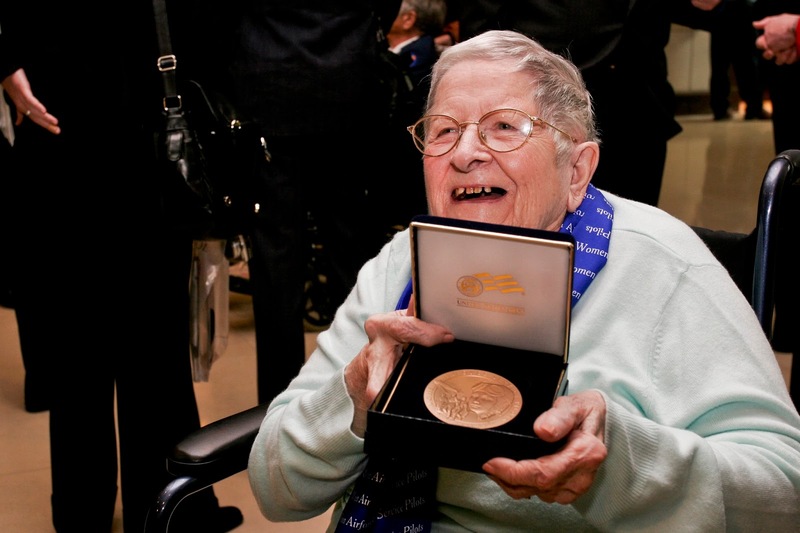 In March, 2010, Lillian, together with her entire family, gathered with other WASP and their families in the US Capitol in Washington, D.C. to receive the Congressional Gold Medal, the highest honour that Congress can award. On August 4, 2013, just four months shy of her 100th birthday, Lillian died of natural causes at her Burbank home. Her loving family well remembers this pioneering pilot for “her wry sense of humour and her love of Angels’ baseball,” which kept the family smiling through the years. Lillian was proud of her independence, and lived alone up until the last month of her life, with the companionship of her beloved beagle (Duke) and her dedicated cat (Tiger Sue). Lillian Glezen Wray will be missed and she will be well remembered. She was an inspiration to all who knew her. Personal note: Although I never had the honor of meeting Lillian in person, we emailed back and forth over the years. 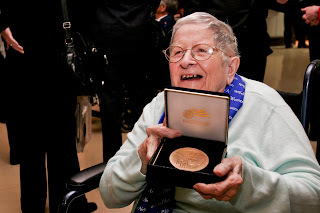 When I sent out the first information to all the WASP concerning the Congressional Gold Medal Ceremony, Lillian was thrilled and replied right away, saying that she would be coming to Washington, DC with fourteen family members. What a wonderful celebration that must have been! Six months later, Lillian emailed that she really didn’t do much traveling anymore, but that she knew she would be making one final trip to Gilmer, Texas. She requested a military funeral and that her final resting place be next to her mother. In late September, her family will be honoring her request and taking Lillian home to the small East Texas town she had always called home. As her family recently said, "Lillian will be looking down at us from the heavens that beckoned her as a young woman to become a pilot. She will live always in the hearts and lives of her family and all those she has touched." God bless her family and all of those who will continue to be inspired by this pioneering lady pilot. “Class 44-W-9” compiled and edited by WASP Betty Stagg Turner copyright 1997. p. 167. “Out of the Blue and Into History” by WASP Betty Stagg Turner 2001 Aviatrix Publishing. p. 513.